Trailhead and parking area are on Rt. 113 in Holderness, NH (summits are in Campton). It is located 5.7 miles east of Rt.3 and 5.9 miles west of Rt. 109. It is on the north side of the road and is signed "Percival Parking". It is also just east of the Rattlesnake and Morgan parking areas. You could also park in the Morgan parking area, but it is usually busier. The Morgan-Percival Loop is a fun hike in the Lakes Region popular for its extensive views of Squam Lake and Lake Winnipesaukee from two open, rocky summits. Many prominent peaks around the lakes can be seen. In addition, sections of the trail and Mt. 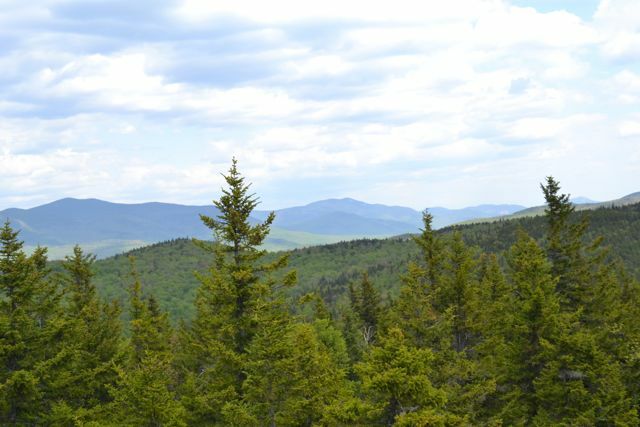 Percival's summit offer views to the White Mountains. Most of the trail is easy to moderate, but just below both summits, you have the option of an adventurous climb up ladders, through caves, and over cliffs. The loop trail has ends at two parking areas, but there is a connecter between them, allowing you to complete the loop from either one. We recommend (and here describe) the hike starting at the Percival parking area (less crowds) and ascending Mt. Morgan first. From the parking area, start hiking on Mt. Percival Trail. The hike begins on a wide, flat, pine needle covered path. In 0.2 miles, turn left onto Morse Trail. This trail meanders at easy grades through the forest, crossing a bridge over a brook in 0.1 miles and reaching Mt. Morgan Trail in another 0.4. Turn right. The Mt. Morgan climbs slowly and steadily through the forest, becoming steeper and rockier the further it goes. After 1.6 miles, turn right and join Crawford-Ridgepole Trail. Reach another junction after 0.2 miles on the combined trails. The right fork is a gradual path to the top. It continues up for a short distance; to reach the view ledge, turn left at the next junction (where the two forks join). Adventurous hikers can take the left fork, which scales the cliffs below the summit by means of ladders, a cave, and rock scrambles. Either way, when you arrive at the ledge, you will find a gorgeous directional view over the Lakes Region. In the center of the view is Squam Lake and the tiny Rattlesnake Mountains, with Lake Winnipesaukee behind. Across the lakes is the Belknap Range. To the east is the Osipee Range. To the west and nearby is Mt. Webster, the next peak along the Squam Range from Mt. Morgan. Further to the left, you can see into the Dartmouth/Lake Sunapee Region. From the viewpoint ledge, continue a short distance on the trail and turn left on a short spur to reach the true summit. From here, there is a limited view to the north, worth the visit. Continue to where the left and right forks join. The trail continues across the ridge to Mt. Percival. In 0.2 miles, the trail passes near the summit of The Sawtooth, the highest point in the Squam Range. It then continues over rolling, rocky terrain, with scattered glimpses to the north, for the remaining 0.8 miles. Mt. Percival is slightly shorter than Mt. Morgan and has nearly the same view, with the addition of a fine view to the northeast to the Sandwich Range. The open rocky area around the summit is much larger, but the view is slightly blocked by trees. Similar to the trail on Mt. Morgan, the trail on Mt. Percival offers an optional boulder cave route. Descending through these caves is quite challenging and requires several tight squeezes; you also have to descend very steep ledges before the caves. From the summit, look for three lines of blazes descending in different directions. The leftmost is the Crawford-Ridgepole Trail; this trail continues across the Squam Range. You must descend on either the middle trail (Mt. Percival Trail) or the trail to the right (the boulder caves route). These two rejoin in 0.1 miles. Continue down the Mt. Percival Trail, a much rockier and more winding path than the Mt. Morgan Trail. The trail eventually moderates as it descends. It crosses a brook after one mile and continues down at easy grades for 0.7 miles to the junction with Morse Trail, 0.2 miles from the parking area.